Kind sir is a zombie. Do NOT play “flip a coin” with Shaggy. Mops on heads make convincing decoys. Same with carrots for ears. There’s a sheriff in every ghost town. There’s probably a coal chute hidden somewhere in your house. Space ghosts are real-ish. AND they have southern accents. A fan, soap bubbles, spring-loaded ironing board and open dryer will get the bad guy every time. 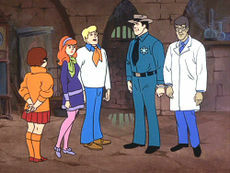 I would’ve gotten away with it if it weren’t for those meddling kids. btw, BB does not like scooby doo. seems to be the new (well, not so new, but you know what i mean) alternative to the ‘violent’ cartoons like power rangers and the superhero shows. the fact that he’s sitting down watching tom and jerry makes me happy enough. but i do love me some scooby. that’s SO weird – I was JUST writing a reference to Scooby D over at my place! Who would’ve thought of Scoob and Shag as American icons?! high icons sporting bad haircuts, dirty clothes with the munchees, but true American icons nevertheless. An educational show indeed. And I was gonna get a “Velma” the next time I went to the hairdresser – dang – I gotta find me a new haircut!